This is what you do when you enter Bark Lake. The one of a kind lake 90 min. from Montreal or Ottawa and close to the internationally praised Tremblant Resort, yet it is so different. As you journey from the marina by boat, you will pass picturesque bays and incredible landscapes. After your 10 min. tour of the lake, you will arrive at Diamond Point. Bark Lake is known for its magnificent landscapes, with over 45 km of shoreline and little disturbed by roads. 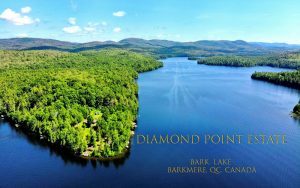 Diamond Point is a most spectacular land feature on the lake separating Wentworth and Cope Bay. The 8 acre lot, consisting of 2 parcels, spans 837 ft. on 2 bays and faces exactly south, allowing sun coverage all day which is also the main source of energy for the new solar system. Coming around the tip of the point, one can get a peak view of the Diamond shaped home sitting high on the property. After ascending to the house, a truly spectacular view opens as you come around the fireplace into the Great Room. The special post and beam architecture is centered on a 24 ft. fireplace of Bedford rock, it is a true eye catcher, as is the spectacular view over the large park-like property, including a Gazebo and the 2 scenic bays. Graciously proportioned and filled with delicate natural light, the open area Grand room includes the kitchen, dining room and a family room corner. With life centering mainly around the outside activities, like swimming, boating, sailing or just relaxing near the water, the house minimizes the space for the 4 bedrooms by offering alcove shaped bunk beds in 3 of the 4 bedrooms. 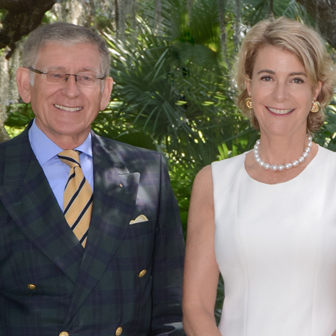 Because of the owner’s international life on 4 continents, the furnishings and artwork represent this lifestyle. The home is turnkey furnished and has high-speed internet connection to allow the owner to continue business while enjoying the lake. This is the place where memories were made and will continue to be made and treasured for many generations.